Blogger’s note: “Groovy” world-premiered at the New York Comic Con held Oct. 5-8, 2017, at Javits Center in Manhattan. I was on hand at the TwoMorrows booth on that Friday, Saturday and Sunday to scrawl my name on advance copies. Following are my memories of my second day at the con: Saturday, Oct. 7, 2017. You couldn’t swing a dead cat without hitting Harley Quinn. That is, a cosplayer dressed as Harley Quinn, in every incarnation, from her 1992 debut (tush-defining jester wear) to Margot Robbie’s 2016 movie version (torn fishnets, Goth-meets-kabuki makeup, baseball bat). Harley was the indisputable winner for Character Most Portrayed in Cosplay at the 2017 New York Comic Con. 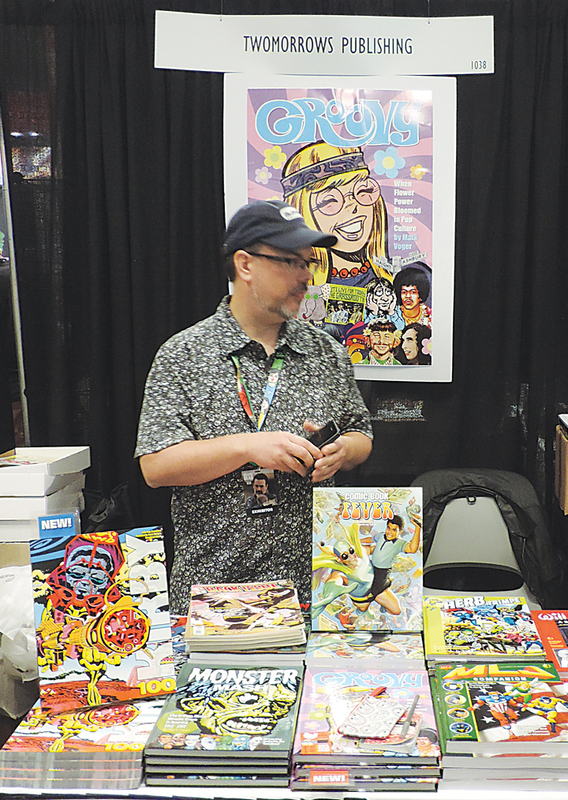 Writer-designer Eric Nolen-Weathington dutifully mans the TwoMorrows booth, #1038. He explained that some years back, one gal showed up at San Diego Comic Con dressed as Slave Leia. The next year, there were 20. The year after that, there were 50. “It blew up,” he said. I saw a guy dressed as Jesus (or strongly suggesting Jesus) carrying a big cross, with a bloody “nail” in his side. Meanwhile, at the TwoMorrows booth, a young Japanese woman, who is an artist, stopped and looked at every page of “Groovy” for about half the book. She was almost squealing with delight, sometimes holding her hand over her mouth. I wish I could have bottled that moment. A “Monster Mash” fan around my age (59) came by. He said a few times that he has OCD. When he was a child, he built the Aurora model kit “Big Frankie” (a large, comical Frankenstein), but his sister destroyed it because it scared her. The gentleman wanted to buy “Groovy,” but was afraid that this same sister, who he lives with, would chastise him for going over budget. Finally, he decided: “I will lie to her.” Then he went through every copy of “Groovy” (even the ones still in the box) to find the most mint-condition one. “I got the best one!” he proclaimed, adding: “I have OCD.” P.S. : Thanks, buddy, for lying to your sister! Doing a con for three days, you get to know your neighbors, even if it’s just an occasional wave across the aisle. Among our across-the-aisle neighbors was Fulcrum Publishing of Golden, Colorado. 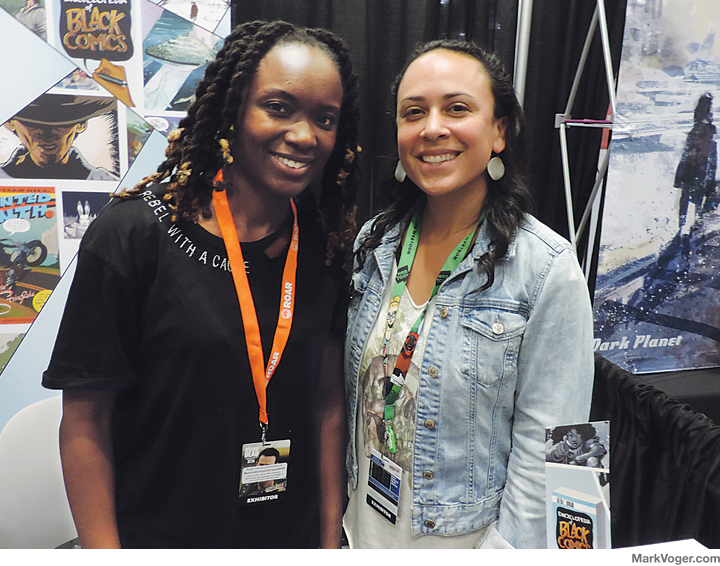 Here is Sheena C. Howard (left), author of “Encyclopedia of Black Comics,” with Fulcrum publisher Melanie Roth. I decided to venture down to Artists’ Alley to see if I remember anyone, or vice-versa. I felt sorry for a lot of the artists; it was way too crowded down there. (Plus, the air-conditioning wasn’t keeping up with all of those bodies). Every aisle was just wall-to-wall people trying to get to the next corner, with agonizing slowness. No sauntering by an artist’s table and casually responding to something that catches your eye. This is Afua Richardson, illustrator of Marvel’s Black Panther spinoff World of Wakanda. 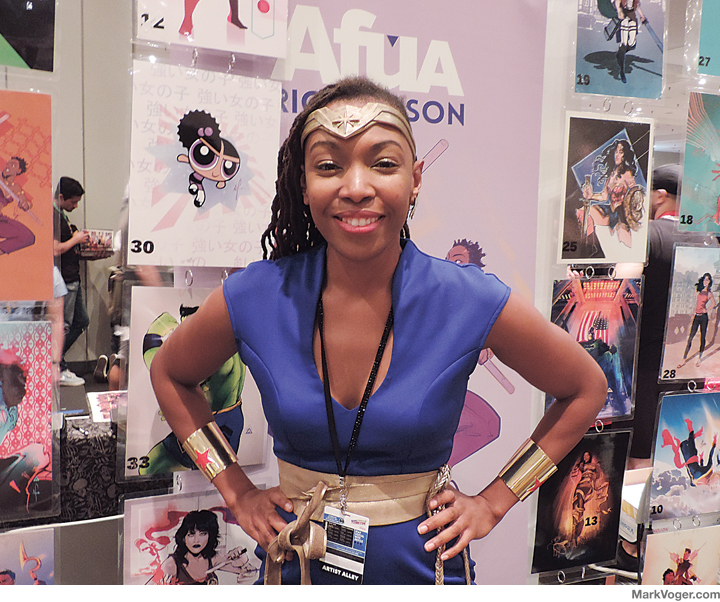 As you can see, Afua likes to dress up as superheroes at conventions. I recommend you look at some of Afua’s other costumes on the Google. Check out her artwork, too — she’s an amazing talent. 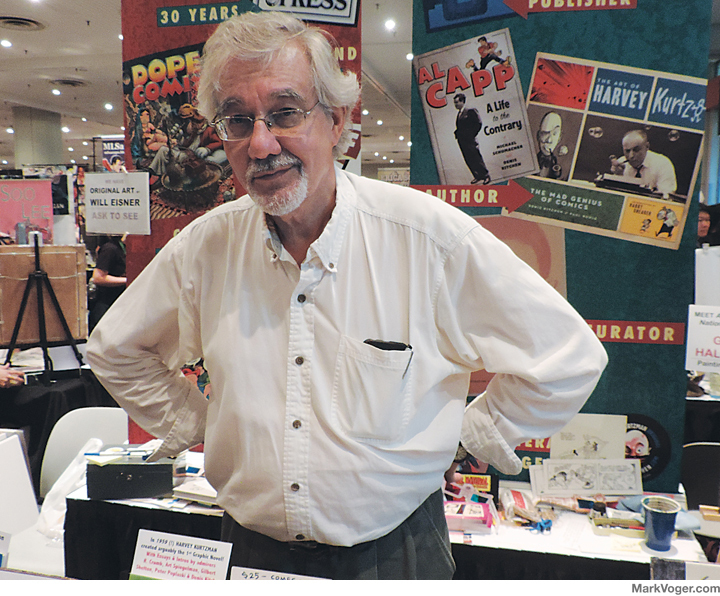 Here’s Denis Kitchen, the underground comics artist who became a prolific publisher championing the work of old masters like Will Eisner, Milton Caniff, Al Capp and (I guess you can call him an “old master” now) Robert Crumb. 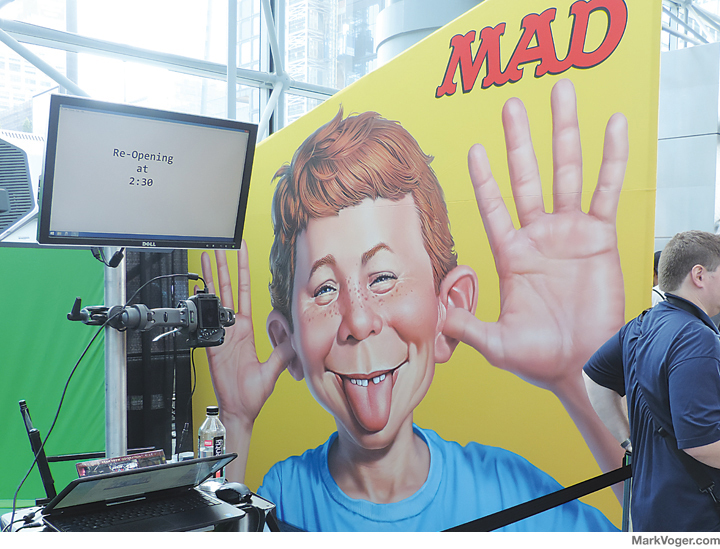 And can you believe Alfred E. Neuman is still around? I won’t say still relevant, but still around. 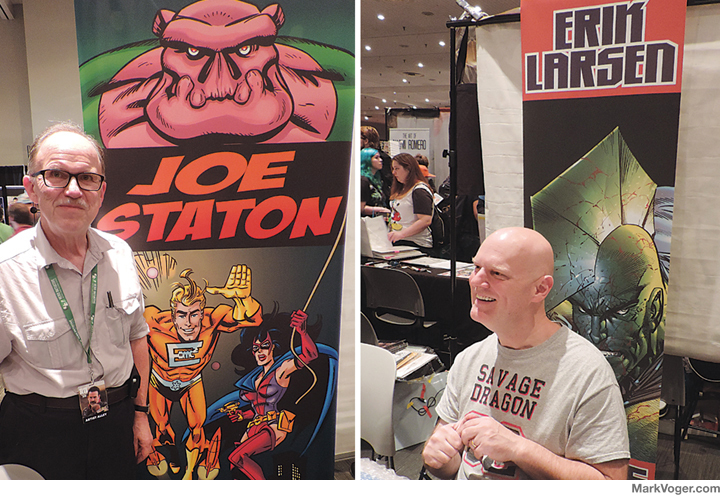 Read about Friday at the 2017 New York Comic Con HERE. 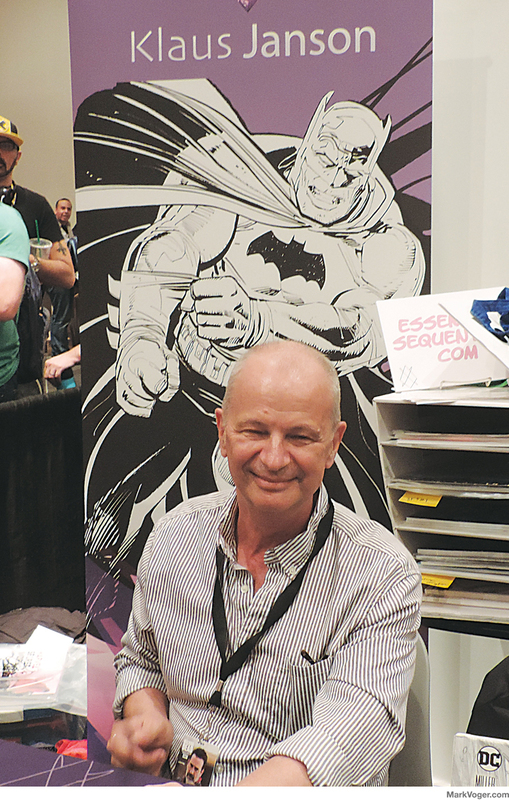 Read about Sunday at the 2017 New York Comic Con HERE. COSPLAY-PALOOZA! Check out New York Comic Con cosplayers HERE.